(Los Angeles, CA) - DENK is pleased to present Visual Field; the gallery's first solo exhibition of works by emerging, Los Angeles-based artist Katy Ann Gilmore. Fascinated by our perceptual relationship to space, Gilmore has devised a drawing-based practice to articulate the world through intersecting line and concise planar geometries, creating spatial impressions far larger than the sum of their minimal parts. Inspired by both natural topographies and architectural constructs, Gilmore distills the plasticity of lived form into linear, two-dimensional strata, taking the most complex experiential impressions of time and space and reducing them to graphic, optical phenomena. In Visual Field, Gilmore continues to consider how the interaction of these two-dimensional planes can create immersive three-dimensional readings of space and explores new phenomenological possibilities through experimental shifts in scale and installation. Gilmore brings a unique interdisciplinary approach to her practice, drawing on her past academic work in both art and mathematics. Strategic, controlled, and logical, her aesthetic and creativity is structured by this methodological reliance on mathematical ways of working. Refusing the exclusionary paradigm that posits art and math at unequivocal odds, Gilmore prefers to remain open to the productive intersection of disciplines. Her interest in structures, both spatial and disciplinary, reveal a fundamental curiosity about the world at large, both natural and humanly contrived. Though based in hand drawing, her works often use mathematical formulae, graphs, or equations to get to the desired end result. It is through this application of systems that something larger about the nature of perception and experience is revealed through her compositions. Working with acrylic ink pens on Dibond, or directly on walls when creating large scale, site-specific murals, and pen and ink on paper, Gilmore is ultimately drafting space, literally drawing it into existence through line, grid, and small intersecting parts, allowing tangential relationships to emerge and resolve through process. The optics of her works, and the convincing way in which they define the recession and emergence of dimension and perspective, is as reliant upon the strategic allowance of negative space as it is upon the circumscription of form. Gilmore's fascination with the visible and invisible registers of perception owes a clear debt to her interest in science and philosophy. The unseen ultimately shapes the reliability of our empirical faculties, and this awareness of the systemic contingencies that allow us to receive and synthesize visual phenomena is integral to her investigations. Gilmore's interest in the structure of space also extends into three-dimensional media. In addition to her completion of several high profile mural commissions for corporate clients like Facebook, Uber, and Vans, she has created sculptural installations from a myriad of unlikely materials including fabric and textile, rubber cord, and steel ball chains, among other things. For Visual Field, Gilmore will be creating a three-dimensional installation in the gallery that will allow the viewer to walk through her orchestration of space, mirroring the structures devised within the two-dimensional works and allowing a more complete immersion into its illusive constructs. Inspired by the intricate systems that allow the human brain to experience and perceive physicality through the synthesis of visual cues, Gilmore creates works that challenge our sense of place to reveal the endless potential of discovery and sight. image credit: Katy Ann Gilmore. Studio Shot: Various Works from Visual Field. Acrylic on Dibond, variable dimensions. 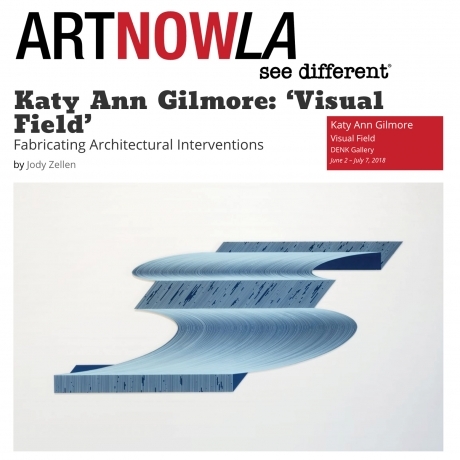 Katy Ann Gilmore is a visual artist living and working in Los Angeles. She received a BA in Mathematics, Art, and Spanish from Greenville College in Greenville, IL, and an MFA in Visual Art from Azusa Pacific University in Azusa, CA. Working in sculpture, installation, and drawing/painting, I'm currently influenced heavily by topography and the relationship between 2D, perpendicular planes and their distortions into 3D space. Founded in January of 2017, DENK is a newly established gallery in Downtown Los Angeles' thriving arts district. Its founding mission is to present a diverse program of local and international contemporary artists working across a variety of mediums, including sculpture, installation, painting, photography, works on paper, and interdisciplinary media. The gallery's goal is to curate engaging exhibitions by artists who are creating relevant, substantive, experimental, or timely work. By providing an adaptable venue that will allow artists to develop their concepts and have them realized, DENK hopes to foster a generative curatorial space.